Calm Coat products are developed for a variety of therapeutic, animal health skin care issues using all natural ingredients as often as possible. was founded in 1996 by a private equine rescue operation that rehabilitates horses in distress. After seeing so many horses with severe skin problems, they came up with an all-natural alternative to the many, many trips to the veterinarian. Thousands of horse and pet owners have found CalmCoat products to be the answer to their animals skin and coat needs. Recommended by Horse Journal an astonishing EIGHT TIMES, our signature product, CalmCoat All Natural Topical Spray was created for the horse with the toughest skin problems. Its unique and patented formula eases a multitude of problems such as sweet itch, general itching, insect bites, rain rot, fungus, sunburn, and scratches to name only a few. But their love of helping animals did not stop with horses. CalmCoat is also quite active in the dog world and soon came up with a line of specific products to enrich the lives of dogs so that they can live in health and comfort too. CalmCoat has helped thousands of horses and dogs and now has a complete line of products for horses, dogs and cats that are changing and improving their lives — and making happy owners too. CalmCoat Has What It Takes To Keep YOUR Dogs Healthy and Happy! Does your dog have itchy, dry flakey skin? Hot spots? Constant Scratching? Help is on the way. CalmCoat has a full line of shampoo and skin care products that can help ensure that your dog stays healthy, shiny, happy and comfortable- from ear to tail! Which Skin Conditions Should I Use CalmCoat Natural Topical? CalmCoat Natural Topical is effective for all irritated skin conditions including hot spots, rubbing, sweet itch, tack rubbing, summer itch and environmental irritations and other itching and allergic reactions. How Often Should I Administer The CalmCoat Natural Topical? Twice a day is ideal. Usually morning and evening until the skin condition has healed than twice a week after the problem is resolved. What Products Does CalmCoat Offer To Help My Dog? We are so glad you asked! Take a look at our great products for dogs below! Immediate relief from itching, scratching and allergic reactions from insect bites. Rapid healing of hot spots. Reduces inflammation, encourages healthy skin and hair growth. Safe to apply directly to lesions, scratches, cuts, and superficial wounds, without side effects or burning. Soothes and provides SPF 7 while providing quick relief of sunburn. CalmCoat EFA (Essential Fatty Acids) Shampoo is a hypoallergenic, soap free formulation with optimal pH balance. It contains emollients for moisturizing and proteins for conditioning. Natural moisturizing factors promote hydration of both the skin and the coat. May be used as often as necessary. Safe for use with topical flea control products. CalmCoat Oatmeal Shampoo with Aloe provides relief for itchy, scaly and sensitive skin. Formulated with colloidal oatmeal, aloe, hydrolyzed oat proteins and emollients to restore natural moisture to the skin. Safe to use for all animals, including dogs and cats. Contains Moisturizers and Vitamins A, D, E and Chamomile. Will not strip the coat. CalmCoat Premium Shampoo leaves the hair shaft completely clean, without coatings of wax, oil, petroleum by-products, silicone, or synthetic polymers found in other shampoos, thereby letting the hair accept moisture from the air as nature intended. Soft and shiny coats for all animals, including dogs and cats. Removes harsh detergents, toxins, and medications that damage the coat and skin, causing discoloration, dullness and itchiness. Helps to discourage unfavorable skin conditions. Extra rich sudsing action that rinses out quickly, leaving the hair soft with a high gloss. CalmCoat Chlorhexidine 4% Shampoo is a full strength medicated shampoo, combining penetrating agents and emollients for optimal therapeutic effectiveness. It contains Chlorhexidine gluconate for antimicrobial activity formulated for all animals, including dogs and cats. Useful in conditions caused by ringworm, fungi, yeast and bacteria. For mild to severe dermatologic conditions where a full-strength antimicrobial, cleansing and deodorizing shampoo may be of benefit. CalmCoat Ketoconazole 1% & Chlorhexidine 2% Shampoo is a full strength medicated shampoo, combining penetrating agents and emollients for optimal therapeutic effectiveness. It contains Chlorhexidine gluconate 2% for antimicrobial activity, and Ketoconazole 1% for antifungal activity. Formulated for all animals, including dogs and cats. Antiseptic shampoo in a synergistic base that offers deep cleansing and deodorizing properties. Used to treat fungal and bacterial skin disease, such as dermatitis and pyoderma. For mild to severe dermatologic conditions where a full-strength antimicrobial/antibacterial, cleansing and deodorizing shampoo may be of benefit. CalmCoat All-In-One Soft Chew Supplement is formulated to provide several nutritional needs, such as Minerals, Vitamins, essential Fatty Acids, Joint & Hip support, and Probiotics, combined into a soft chew. Dosage is based on the weight of the pet. Cold pressed processing allows for a higher nutrition value than heat processed nutrients. The only product of its kind on the market today. Formulated just for dogs. Multi required Vitamins and Minerals. Glucosamine and Chondroitin for hip and joint function. Fatty Acids for healthy skin and coat. For dogs over the age of 12 weeks. Made in the USA. Available in 60ct and 90ct chews. Don’t Let Your Dog Suffer, CalmCoat Has Products That Can Help! 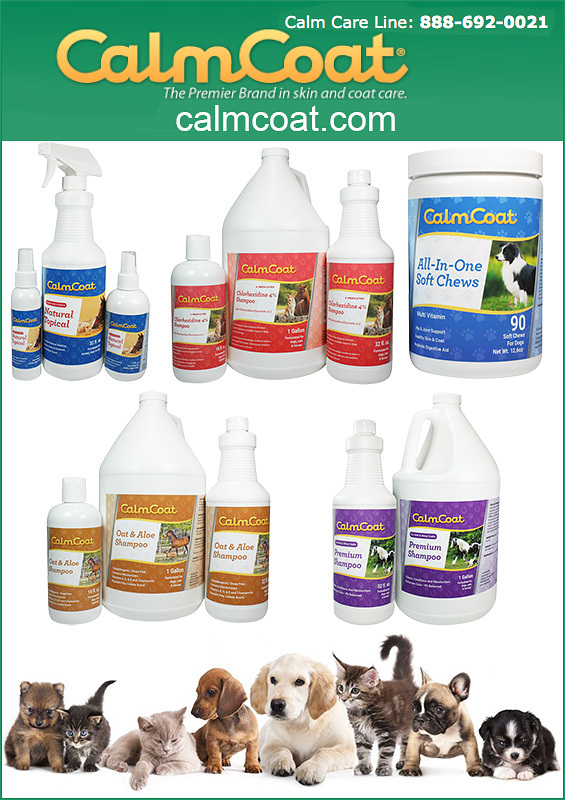 Many pet stores carry CalmCoat products. You can also find us at great online catalogs like PBSAnimalHealth, PuttinOnTheDogShop and more! You’ll love the way CalmCoat makes your dog feel! Order Today!